Oksana was called to the Bar of Ontario on June of 2017. She earned her common law degree (JD) from the University of Ottawa in 2016. She also holds a Bachelor of Arts (Honours B.A.) from York University with a major in international studies and a minor in philosophy. During her legal studies, Oksana worked as a teaching assistant with the Legal Writing Academy at the University of Ottawa’s Faculty of Law. She was also a teaching assistant for the Faculty of Law, Common Law section’s Alternative Dispute Resolution course. During law school, Oksana was part of the Women`s Legal Mentorship Program, where she mentored first-year law students. 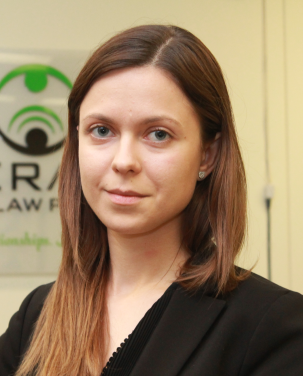 Oksana worked as a summer student at Gerami Law PC in 2015, and then returned to the firm to complete her Articling between August 2016 and June 2017. She was thrilled to return at Gerami Law PC as a Barrister-at-Law in July 2017. Oksana practices in areas of immigration law such as Express Entry, family sponsorship, temporary residence applications, and applications based on humanitarian and compassionate considerations. She also assists clients to overcome inadmissibility concerns arising out of criminal convictions or allegations of misrepresentation. Outside of work, Oksana holds a third degree black belt in taekwondo. She also enjoys travelling, ballroom dancing and classical literature. Oksana is fluent in English and Ukrainian.